Is “Deathtrap” a play to kill for? First produced on Broadway in 1978 with a run of over 1700 performances, “Deathtrap” has been a favorite of theatres ever since. Does that make it worthy of killing for? Suspense builds in the play through many surprises and dramatic threats to our loving couple, Sidney and Myra. Sidney (played by Gregory Crane) is a murder mystery writer with writer’s block. Myra (played by Amber Collins Crane) tries to keep Sidney focused on writing. Clifford (played by Bryce Smith) comes into the house to help. All in all, this could be a typical family in crisis. A couple of murders and shocking events change that simple theme into real suspense quickly. Surprisingly, RVP’s new show is not directed as a dark murder mystery, but as a comedy. 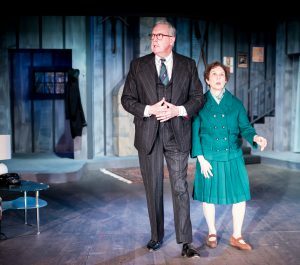 It is a dark comedy, with tragic writer’s block and enduring greed, but the antics keep the laughter coming as bright relief after the emotional surprises that await us onstage. Amber Collins Crane and Gregory Crane make a good couple onstage. Crane, as the husband, can no longer write successful murder mysteries and, instead, acts out his thoughts in the comfort of his home. Collins Crane’s character is forever tense and nervous, anxious to pull her husband out of his depression, but unable to bring him back to reality. Soon “Deathtrap” the play becomes “Deathtrap” the production and fierce suspicion rules this happy, murderous home. Clifford (played by Bryce Smith) comes in to help, literally bursting with ideas and solutions. Smith is convincing as the innocent pawn with thoughts of the throne. The high energy competition between Sidney and Clifford in act II drives the humor into a murderous conclusion. Smith’s energy is infectious. Helga (played by Marsha van Broek) raises the bar on the play’s humor with her totally fake gypsy psychic antics. van Broek breaks the monotony of her role at just the right points to become reassuringly rational, stating the obvious to everyone in a comforting voice. Good work. Porter (played by Tom Reilly) could be an attorney in real life, with the accuracy of his portrayal of the family estate lawyer. It’s amazing. Reilly’s calm eye for detail keeps the plot going smoothly from crisis to crisis right through the end of the play. The set by Tom O’Brien is relaxing and disarming at the same time. Michael Walraven has built an excellent example of an upstate barn extension with an upstairs bedroom suite. The fireplace is warming through the various murder scenes and onstage power failures. Director Chloe Bronzan takes a fairly routine, tired plot and turns it into a bright, macabre comedy. Suddenly, the 1960’s are alive again, with typewriters and furniture and costumes and phones that make sense to us here in 2019. Of course Michael A. Berg (costumes) and Dhyanis Carniglia (properties) have helped a lot to bring the ambiance back to the 1960’s. This is a fun production that draws the audience into the play. RVP proves that “Deathtrap” is a play to kill for onstage, and to enjoy in the safety of the audience. Ross Valley Players’ new seats and smaller house (99 seats) make seeing the play more enjoyable, but reservations are critical. Make sure you reserve in advance and do not depend upon getting tickets at the door. “Deathtrap,” by Ira Levin is produced by Ross Valley Players. Directors: Chloe Bronzan. Scenic Designer: Tom O’Brien. Costume Designer: Michael A. Berg. Sound Designer: Bruce Vieira. Lighting Designer: Tina Johnson. Fight Choreographer: Richard Squeri. Cast: Gregory Crane: Sidney Bruhl. Amber Collins Crane: Myra Bruhl. Bryce Smith: Clifford Anderson. Marsha van Broek: Helga ten Dorp. Tom Reilly: Porter Milgrim.